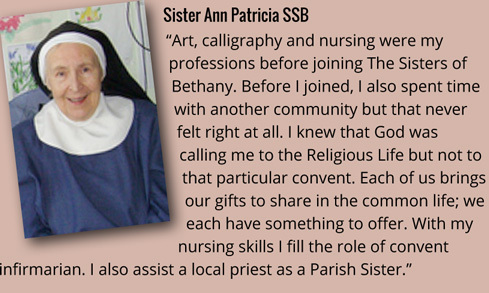 May I test my vocation with The Sisters of Bethany? If you feel that you’d like to test your vocation with The Sisters of Bethany, you are welcome to contact us to ask for general information. We will send you some details with no obligation to take it any further. Then it’s up to you to contact us again if you would like to come for a visit. On a first visit you will be treated as our guest, and you may ask any questions you wish and meet us all. Then, if you want to, you may come for a second visit or as many as you wish. At any time, after the first visit, you may ask to spend some time with us as an official ‘aspirant’. We Sisters of Bethany do not have a “cookie-cutter” approach but welcome a wide range of traditions, personalities and backgrounds. An Aspirant lives alongside the community; they stay in a guest room, but attend offices and do light work to discover if they might like to join as a postulant. If they do, after an interview and a request in writing, they may be admitted into the Novitiate. If they don’t want to join, there’s no problem and if a person is ‘searching’, we may be able to suggest where a person may look next if they wish. A person in the first stage of training. In this community the first stage can last from three to nine months. During that time the postulant learns the basic set-up and routine of the convent from the inside. They are given a gentle timetable, which can be adjusted if needed, and some work to do at set times during the day. A postulant wears her own clothes with a small wooden cross given to her when she is formally admitted. It is an opportunity to explore the Religious Life as lived by this community. 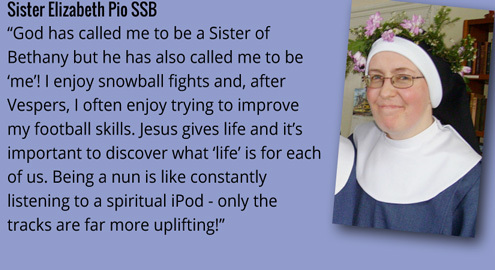 It is a time of prayer, testing and discernment, getting to know the sisters and their daily life. There is no pressure to go on to the next stage and she is free to leave at any time. The individual may request to be elected as a novice between three and nine months. A Novice is in the next stage of training where she will live more or less like a professed sister. The timetable is fuller and she will be introduced to more duties, especially taking part in chapel Offices. She wears the habit of the community with a grey veil. She promises to: live by the Rule of St Augustine, treat all with loving kindness and be a peacemaker while she remains a novice. She can also change her name if she wishes with prior permission from the Mother Superior; from then on she has the title ‘Sister’. A Novice is still in a testing stage of her vocation, with training and guidance, to help her to discern God’s will for her. She is still free to leave if she wishes. A Novice Sister can remain in the Novitiate for up to five years. However, at the end of two years she can request to make final vows if she feels ready and the Chapter (all the Professed Sisters) are in agreement. The Novitiate is a collective term for those in the training stage of a religious community. It refers to both postulants and novices. It can also mean the room/area that is set aside for their use (for classes, relaxation. work etc). Women who feel they have a vocation to live the Religious Life, and are over twenty one years of age, are able to come and test their call. On first entering the Novitiate she spends three to nine months living as a postulant; then she may be received as a Novice for a period lasting for not less than two years and not more than five; after which a life commitment is undertaken with vows of Poverty, Chastity and Obedience. During this time of learning about and entering fully into the Community’s Life the process of discerning God’s will for the individual takes place. No, not individually. The Religious Life isn’t something you go into for financial reward. Any work we do is unpaid and voluntary although Sisters may receive travelling expenses for talks etc. Any income belongs to the community, not to an individual. We live simply, but have what we need and share what we have – needs are different from wants. Do I have to give up everything? Not at first. A postulant keeps control of her finances and her property. However, the amount of possessions a postulant has within her room here, does have a limit. She may have to keep some belongings in storage in the convent, or elsewhere, e.g. with friends or family. She keeps her purse, cash and cards with her. All property and possessions of the postulant remain hers. The community will support her and pay certain expenses. When a postulant becomes a Novice, any belongings that are in her room are discussed with the Novice Guardian. At the discretion of the Novice Guardian, anything that is considered unnecessary is stored away or moved to a more open room e.g. the novitiate, to be shared. Her purse is kept safe by the Novice Guardian. Money, for necessary expenses, or necessary items, will be given to her by the convent. A novice can ask for permission to spend her own money on something and her purse will be given back to her for use on ‘Rest’. All property and possessions of the Novice remain hers, though some of her possessions will be available for use by others in the novitiate and convent, for as long as the person remains. It is only at final profession that a Sister gives up her accounts, property and possessions, to be given away, sold, used in community or disposed of(if they are of no use). A Professed Sister has to have permission to keep anything. The convent may keep, or allow the Sister to keep, some useful items if they are offered, but they are no longer considered personal property. Do you take a vow of silence? No. The vows are Poverty, Chastity and Obedience. In obedience to the Rule, we keep silence in certain places in the convent and during certain times, unless talking is necessary in charity, hospitality, courtesy or questions about a task. We keep silence to aid prayerful work and a peaceful environment. We talk in the times and places designated, and try to avoid unnecessary chatter and noise. Do you take vows for ever? Yes. After a Novitiate (training period) which can last from two to five years, a Novice Sister can request the Chapter to elect her for Life Profession. If the Chapter agrees, she can take Life Vows in Poverty, Chastity and Obedience within the Society of the Sisters of Bethany, and is then a full member of the Community for the rest of her life. Unlike most Communities there is no ‘junior stage’ as such i.e. vows promised for a number of years and renewed if wanted. A Novice goes straight from the Novitiate, which is actually closely integrated with the lives of the fully Professed, into Life Profession. However, a new, fully Professed Sister, does have extra time for study and continuing training for the first three years. Will I see my family again? Yes. A person is free to visit their family during their ‘Rest’. Family and friends are also welcome to visit (some time will be made available to spend with them, go out for a meal, a walk, etc). Sisters are encouraged to keep in touch with their families by writing regularly. Telephone calls can also be made to them, and they can also ‘phone you. Do I have to be a Roman Catholic? No, we are an Anglican Order in Church of England. However, we do have ecumenical links throughout the country and internationally. Can I join if I’m divorced? It is certainly a possibility. Each person’s situation will be considered individually. Any children the individual has, will have to be adult and independent. Can I join if I’m well over 16? We don’t accept women under 21, as it is important that they have some life experience first. This may be from further/higher education, courses, independent home-life or some sort of work experience. Experience of ‘ordinary living’ is important in the discernment process and can help the person understand the mainstream secular life before entering community. Many people of varying ages are joining religious communities across the country. There are still younger people in their 20’s and 30’s, but also more mature people who are joining novitiates in their 40’s, 50’s and 60’s. What if I’m not healthy enough? We try to be accepting, as we are based on the Visitation communities which were founded to enable women of ‘delicate health’ to work ‘outside the cloister’. Each person’s situation will be considered individually. What if I’ve been turned down or asked to leave by other communities? We try to be accepting and understanding of any difficulties a person may have had, in adapting to life in other communities. Many people may have to go through ‘living alongside’ or ‘novitiates’ of other communities, to discover God’s will for them. Each person will be considered individually and not judged or turned down, purely because they were not right for another community. All communities are different. There are Sisters here, who started off in other communities before finding their calling with us, and they are now professed and happy. What is the habit like? The dress of the habit is blue and usually ankle length, with long sleeves. The sleeves are fairly loose, but not impractical for daily living and work. A warm material used for the winter habits and a lighter, cooler material for summer habits. We usually have two of each kind. The scapular is also blue. A scapular is like a long version of a tabard, and has the simple, practical purpose of keeping the dress clean and undamaged. ‘Veil’ is commonly used to refer to the complete head-dress. However, the veil is just the coloured part which hangs down the back. The veil is velcroed in place to a separate garment, the cap. The cap covers the hair and folds back showing the distinctive white band; it is secured at the nape of the neck with velcro. The veil is worn at all times. Unlike some communities, we do not have indoor and outdoor veils and neither do we have wimples. Professed sisters also have a gold ring on the third finger of their right hand to symbolise their commitment to the Lord. Apart from our clothes being blessed at Reception and Profession, there is important religious symbolism connected with each part of the habit and veil, but for the purpose of simplicity it won’t be gone into here. Yes. We get four weeks ‘Rest’ a year that can be spent in the convent or elsewhere with family, friends, associates, or another religious community etc. Each Sister has a day off each month and a half-day a week, circumstances permitting. Also we don’t do any un-necessary work on Sundays. Do you ever go out? Yes. We are not an enclosed community, and even enclosed communities have large grounds and are not locked in! We try to live the mixed life of prayer and service. 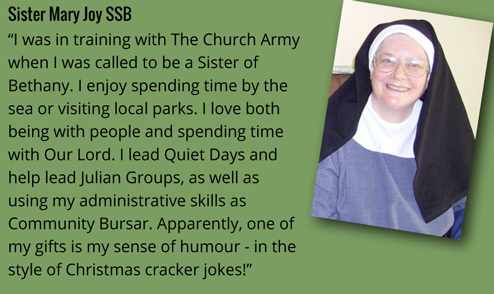 So, we do undertake unpaid work in the local community – such as prison visiting, chaplaincy duties etc and also go out visiting, for walks, conferences, necessary shopping, Rest, etc. Yes. We have a lovely big wide-screen TV in the Community room where we can quietly watch the news or a video in our free time or days off. However, as we live in a house which is used for Quiet Days and Retreats there are no televisions for the use of visitors! Each Office has a sung hymn. Parts of Vespers are sung, or all of it may be sung depending on the day i.e. weekend, ordinary, memorial, feast, or solemnity. Parts of Compline are also sung. On Sundays and special festivals there is a sung Mass, with the organ. Yes, along with Easter and other Christian festivals; some are more general and others are specific to our community. At Christmas we put up decorations and have Christmas dinner, cards, carols and there are some gifts that are given to the community from Associates and friends, for the use of us all. We avoid the commercialism of Christmas and make more of its real meaning as the birth of the Saviour of the world. Yet, the biggest celebration in Christian community life, is that of Easter.